The Spine or backbone provides stability to the upper part of our body. It helps to hold the body upright. It consists of a series of irregularly shaped bones appearing in a straight line. 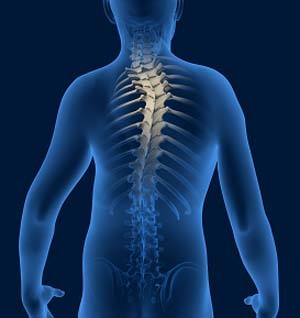 The spine has two gentle curves, when looked from the side and appears to be straight when viewed from the front. When these curves are exaggerated, pronounced problems can occur such as back pain, breathing difficulties and fatigue. Scoliosis: It is a condition where the spine or back bone is curved sideways instead of appearing in a straight line. It curves like an “S” or “C”-shape. Larger curves cause discomfort while the small curves do not cause any problems. Treatment for scoliosis is based on the assessment of the curve, cause and age of the patient. Mild scoliosis (less than 25°) may not require treatment and will be observed by the physician every 4 to 6 months for any progression in the curve. Bracing may be needed if the curve is more than 30° to help to slow the progression of scoliosis. Surgery is an option for individuals with severe scoliosis (curve>40°) to stop the curve from getting worse. The most common surgical procedure is correction, stabilisation and fusion of the curve. Lordosis: Lordosis is a condition characterised by abnormal excessive curvature of the spine, sometimes called swayback. Treatment for lordosis depends on the severity of the condition, age and any neurological defects if present. In cases of mild lordosis, no treatment may be initiated, and your physician recommends ‘a wait and watch’ approach and observes the curve every 4 to 6 months. If any progression is observed in the curve treatment may be initiated. Physical therapy (exercise program) may be recommended to increase range of motion, flexibility and strength. Analgesics and anti- inflammatory medications may be prescribed to relieve pain and inflammation. Bracing may be necessary to prevent the curve from worsening. Surgery may be indicated for severe lordosis with neurological involvement. Kyphosis: Kyphosis is a condition where an abnormal curvature of the spine occurs in the thoracic region resulting in round back appearance. Treatment depends on the cause of the condition and may include bracing, physical therapy, medications and surgery. Bracing may be necessary to prevent the curve from worsening, if the cause of kyphosis is Scheuermann’s disease. Physical therapy (exercise program) may be recommended to increase range of motion, flexibility and strength. If caused due to osteoporosis, medications may be prescribed to prevent future compression fractures. Surgery may be recommended if kyphosis is debilitating and painful and does not respond to conservative treatment methods.